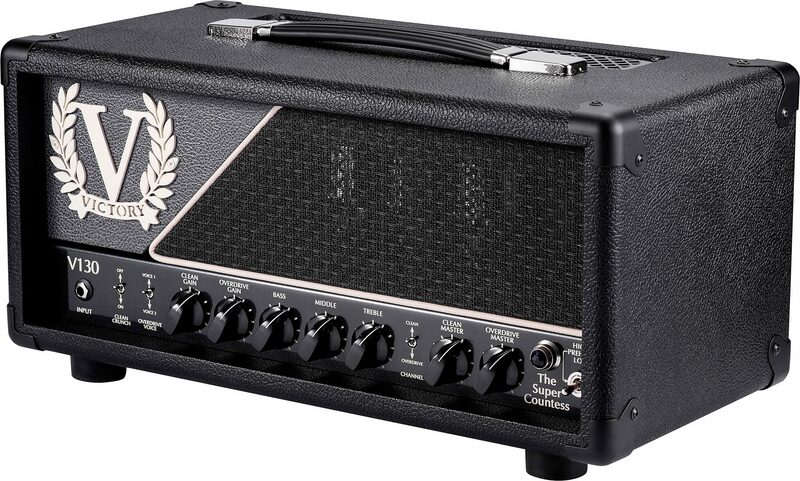 The Victory V130 The Super Countess offers 100 watts and four footswitchable all-valve modes along with staggering versatility with power aplenty for any stage. The V130 evolved from the Victory V30 The Countess model, upscaled in power, and adding shades of V40, The Sheriff 44 & VX The Kraken. V30 The Countess has two channels: very high headroom clean and very heavy overdrive (just as Guthrie Govan wanted it). In V130 we've added two modes in between. The Clean channel gets a 'crunch' mode for light breakup and classic overdrive that's reminiscent of sounds in V40 and The Sheriff 44. The Overdrive channel's extra mode is Voice I, derived from channel 1 of VX The Kraken with the input of Rabea Massaad. They're all footswitchable. Balancing your cleaner and gained sounds is often a challenge, especially in a band context. With V130's massive headroom, the channel masters give you the control you need to make sure all your tones are heard loud and clear. People have asked why the tone controls are common to all modes: the answer is that the EQ is optimized to work across the range. Get it balanced to your chosen cab -- not too much, not too little -- and V130 stays poised across all modes. A series effects loop sits between pre and power sections for whatever pedals you want to put in there. We find that modern digital delays and reverbs can sound cleaner in the loop, while more traditional analogue delays, modualtions and so on sound great straight into the front of the amp. The only 'right' way is the one that sounds best to you. 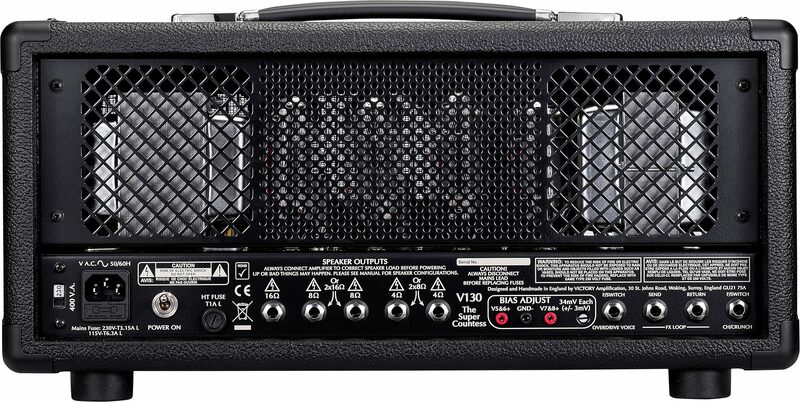 100 watts of 6L6 power section can be eye-poppingly loud if you want it. But it's not just about volume: V130's high-headroom abilities give you clarity and massive dynamic range right across the loudness spectrum. It's a feel and response that many players love. You can also switch down to 30 watts for a less bold feel, lower volume and more power-stage "give." Take all the hassle out of replacing output valves with the V130's external bias measurement points and adjustment. All you need is a new set of power valves and a multimeter. 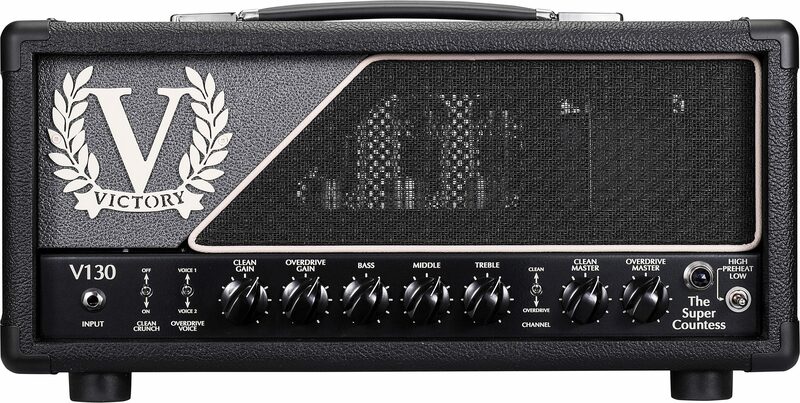 It's fast, safe and reliable -- you can find full instructions in the amp's manual.